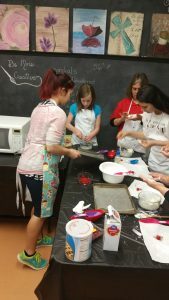 Private Party – Host your own! Merchant Kitty is an art studio where you can relax and rejuvenate through creative focus. a variety of creative projects are offered from paint night and wood crafts to paper crafts and floral arrangements. Now extracurricular learning is offered every weekday from 4:00 pm to 5:30 pm. This is perfect for kids ages 8 through 14. Older and younger children are welcome to attend at their parent’s discretion. Monday, Wednesday and Friday will be Art Expedition. We will use all different kinds of art media and give kids a chance to see what their favorite way to create is. Tuesday and Thursday will be a Tech Tour hosted by Rogue Circuitry. They will be getting into the nuts and bolts of the computer (literally) and learning how computers work, how to take care of them, and how to put them together. It is especially geared for the younger audience and will have lots of hands on projects and games. More information can be found here! We will welcome new enrollees all year long! You can join a class or walk in during Studio To Go hours to complete a number of DIY projects with one on one instruction. Painting and crafting is always more fun with friends! And its always more fun when the mess is not at your house! So come on in, no matter what your artistic skill level is, take a break and create! I choose projects for their ease of completion and perfect the process so that you will be guaranteed to succeed. (basically I do all the Pinterest failing so you don’t have to!) That way, the projects are suitable for all skill levels. You can even choose your own projects by hosting a private party. 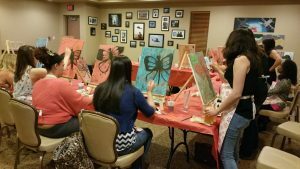 Painting and crafts make the best get togethers, especially when you are meeting for celebrations like birthdays, showers and going away parties, trying to promote team building with your business or organization, or just wanting to have a fun night out! I also do some freelance production, so if you need a special personalized gift or customized piece feel free to contact me! And take a look at what is coming up soon!